Knowledge Base: Glossary of Battery and Charger Terms and Definitions. What gives GB Industrial Batteries their superior level of quality? Our Advanced Design Separator and Paste Formulation, together with lower internal resistance, performance engineering and careful assembly, work together to make GB the best deep cycle industrial batteries available. Our exclusive separator is designed to deliver superior electrolyte distribution, lower water usage and reduced positive shedding, so our batteries last significantly longer. Our proprietary paste formulation is the key ingredient to long battery life. What are Gel, AGM and SLA / sealed lead acid batteries? Gel cell or sealed lead acid batteries have basically the same chemistry as conventional wet or “flooded cell” batteries. The battery electrolyte is in a gelatin form (GEL) or is absorbed into a glass matt (AGM). The battery is then sealed with epoxy. They are exceptionally leak resistant and may be used in any position, but cannot be re-hydrated when they eventually begin to dry fail. Applications include UPS devices, emergency lights, and wheelchairs. These batteries contain 2 volts per cell with common voltages of 4, 6, and 12 volt. They are not recommended for use in deep cycle or forklift applications. Does GB offer a Gel, AGM or SLA “Maintenance Free” / “Low Maintenance” battery? We did from 1996 to 2001, but determined that they could not withstand normal use for more than 3 years, making them an impractical solution to conventional lead acid batteries. They are not cost effective in forklift applications for the following reasons; A) more than double the cost of conventional, B) they require a special charger, and C) the short 3yr life expectancy vs. 7yrs for conventional batteries. · Weekly battery watering takes just one to two minutes. · No user contact with the battery or vent caps. · No safety equipment required (such as eye wash systems and protective gear). · Narrow isle trucks do not require removal of the battery for watering. · Accidental overfilling, acid overflow and corrosion are eliminated. · You will achieve the maximum number of cycles and productivity, usually 7yrs or more. · The optional battery water level indicator light further reduces maintenance by eliminating unnecessary water level checks, and allows operators and management to easily monitor water levels at a glance. GB Battery Watering Systems: Pricing and additional information. Does GB ship their batteries filled and charged? Yes, all GB industrial batteries ship filled with electrolyte, fully charged and ready for immediate use, including international export shipments. Do I use the cables and plug from my old battery on my new battery? No, all new and reconditioned batteries ship with the correct cables and plug installed. Will my new battery be compatible with my existing charger? Yes, provided your existing charger was sized correctly for your forklift at the time of purchase. Does GB charge for delivery or freight? Freight is included as an option within the checkout cart on applicable battery models. We deliver to destinations within the continental United States on new and reconditioned forklift batteries and chargers. 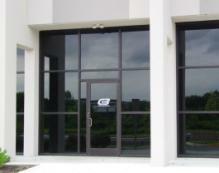 We only charge for installation (if requested) @ $95/hr in most markets. 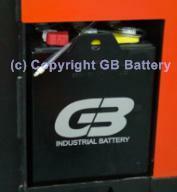 Where is my nearest GB Industrial Battery Sales Office? Please see our global branch locator page to locate the nearest GB Industrial Battery distributor. · From our experience, this is the number one cause of battery failure. · Charging batteries that are as little as 1” low on water can cause damage to the entire battery that can never be repaired. It dries and burns the uppermost portion of the “plates”, causing high resistance that is permanent, and effectively isolates the portion that remained submerged. · Even when the proper water levels are restored, the damaged portion continues to cause high resistance and the battery runs much hotter from that point forward, causing accelerated water loss and further plate damage due to overheating. · Industrial batteries are typically designed to last at least 1,500 charge cycles, over a five to fifteen year period. Each time you charge a battery, regardless of how long, it constitutes one cycle. · Consistently charging a battery twice per day, during lunch breaks for example, is known as Opportunity Charging, and reduces the useful life of a battery by 50%. · The additional heat generated by opportunity charging a battery usually reduces the run time equal or greater in proportion to the amount of charge it actually received, making the practice completely ineffective and costly. · Routinely charging the battery before it is 80% discharged is another common form of over charging. For example, if you only use the battery a few hours a day, it’s best to use it until it is truly in need of charging before actually plugging it in. Remember, each charge constitutes one cycle, so try not to charge unnecessarily. · Commonly occurs as a reaction to low water levels, but is a major problem unto itself. · Flushes the electrolyte from the cells and gradually dilutes the acid to the point that the battery can no longer function properly. In many cases this can be remedied sending the battery out to have the acid adjusted, but the battery’s life will still be shortened somewhat. · Causes tray corrosion (listed below). · Batteries should receive an Equalize Charge once every 10 cycles. · Almost all chargers are equipped with an Equalize feature. On older chargers, this setting is usually referred to as Weekend or Weekly charge. · Selecting this setting adds 3 additional hours to a normal charge, ensuring all of the cells in the battery reach full charge, and the allowing extra time for the electrolyte to mix during the Gassing Stage. · Failure to equalize causes reduced battery run time and eventual failure, due to Sulfation, Stratification, and an imbalanced capacity between the cells. · Batteries should be rinsed or washed at least once per year to prevent corrosion. · Even when the proper water levels are consistently maintained, sulfuric acid vapors escape during charge. These vapors leave an oily sulfuric acid residue on the top of the battery around the vent caps. Over time, the water in the residue evaporates leaving full strength, concentrated acid that is much more concentrated than the diluted acid inside the battery. · The concentrated acid is very conductive. As it gradually accumulates and spreads out, it eventually makes contact between the intercell connectors across the top of the battery. This results in shorting between the cells, causing the battery to self-discharge, and additional heat during charge and use. · Even though battery trays have a baked on powder coat finish, they will easily corrode if the residue is not rinsed off. The corrosion will become progressively worse until it is either removed, or it destroys the battery. CABLE CORROSION – REPAIRABLE: This is a commonly overlooked problem which causes reduced run time and all of the classic symptoms of a bad battery or cell. Many times this is the only problem, and replacing the corroded cable increases run time dramatically. · CAUSE: If the battery is not rinsed periodically, acid penetrates the seal between the cable head and the insulation and begins to oxidize and corrode the copper conductors. The cable gradually swells over time as the copper breaks down, deteriorating the connection gradually until the battery no longer accepts a charge. Examples of Battery Cable Corrosion: Swollen near terminal, copper is replaced by blue corrosion. Positive Plate Growth – NOT REPAIRABLE: The true sign that a battery has reached the end of its useful life, and is in need of replacement. Typically begins to occur after 5 years. As batteries age, the positive plates begin to soften and expand in size. This causes internal pressure inside the battery cells. Most manufacturers now use floating bushings on the positive cell posts to allow for this gradual expansion and reduce stress on the cells internal components. Eventually, as the battery reaches the end of it’s normal useful life, the internal pressure is great enough to push the positive posts well beyond normal tolerances and can begin to distort the cell covers and vent wells. Positive plate growth is normal and should be considered as a wear indicator. If your battery is no longer holding a charge and shows signs of plate growth, it should be replaced, not repaired. · Batteries can fail and be beyond economical repair without showing noticeable signs of plate growth. However, plate growth is a sure, visible sign that the battery is beyond economical repair. · Positive plate growth typically occurs after 5 years or 1,500 cycles. If it occurs in less than 5 years, it is most likely due to opportunity charging or over charging, which should be addressed when replacing the battery. · This condition usually affects the Positive posts only, and will give an uneven, slanted appearance when viewed from the side, looking across the top of the battery. · SHORT RUN TIME: Progressively shorter run times could be caused by a malfunctioning battery OR charger. It is best to have both checked if you begin to experience shortened run time or suspect a problem. · EQUALIZE CHARGE: Industrial batteries must receive an equalize charge at least once per month, or permanent damage will result. Never equalize more than once every 5th charge cycle, or damage will result. Reason: Selecting equalize mode on your charger adds 3 additional hours of charge time to that charge cycle, ensuring all of the cells reach 100% charge. Equalizing too often or too little will shorten battery life. · WHEN TO ADD WATER, AND HOW MUCH TO ADD: Water can be added before or after charging. Add just enough water to cover the perforated element protector (visible at the bottom of the vent well). Never overfill. Reason: The water level rises up to one inch during the last (3) hours of recharge due to “gassing”. The visible water level before charging is always lower than after charging. Any excess water will simply overflow and cause corrosion and damage your lift truck. See “Proper Battery Care” for more information. · NEVER ALLOW BATTER WATER TO RUN LOW OR DRY: Water should be added every 5 to 10 charges or permanent damage will result. · WHAT KIND OF WATER TO USE: In general, normal city water will suffice, but if you have any doubts about purity of the local water supply, A) contact the GB battery supplier in your area B) get a chemical analysis of the water C) use distilled water. · ADDING ACID: Never add sulfuric acid to a battery. If an acid spillage occurs, contact the GB battery supplier in your area. · SPECIFIC GRAVITY (SPGR): See SPGR chart below. · OVER DISCHARGING: Never over discharge batteries. More is not necessarily better when it comes to recharging batteries. Most battery manufacturers warrant their batteries for up to 1,500 cycles of charge and discharge provided, among other things, that the battery is never discharged beyond 80%. This normally coincides with an eight-hour shift. Trucks fitted with extra equipment such as clamps, high speed lifts, etc. will need a higher capacity battery to ensure the battery is not discharged beyond 80%. Lift truck interrupts are available to detect the correct discharge level and are recommended by battery manufacturers as a means of ensuring batteries are not over discharged. The best way to ensure batteries are not being overcharged is to periodically (once a month) check the temperature of the center cell on a battery at the end of regular charge. If the temperature of the electrolyte is more than 36° F above the ambient temperature, call your battery technician— there is a problem. · AVOIDING SPARKS: Batteries produce and store hydrogen gas, which is highly explosive. Never weld near a battery. Never place metal objects on batteries. Such objects can cause a short circuit between adjacent cells and result in possible injury to those close to the battery. Similarly, people charged with caring for or operating batteries should not wear any metal jewelry. · UNDER-SIZED CHARGERS: A charger that is more the 100AH less than the your battery’s rated capacity. Will result in an undercharged battery with significant reduction in operating life. Your local GB vendor has all the information to ensure the battery and chargers are precisely matched. · OVER-SIZED CHARGERS: A charger that is over 100AH more than your battery’s rated capacity. Can overcharge and overheat your battery, reducing the operating life of your battery. · WHEN TO REPLACE A BATTERY: Repair or replace batteries when capacity that has fallen below 80% of its rated capacity. Continuing to operate a bad battery can damage a truck's electric motor and electronics. Failing batteries also require recharging more frequently, wasting hundreds or thousands of dollars in energy per year, depending on the size of your fleet. · RECORD KEEPING: We recommend that each forklift, battery and charger in your fleet be given a unique number for easy identification and tracking purposes. Keep regular records on the maintenance of batteries. For instance, keep a log of ever time a battery is watered and equalize charged, or at minimum, each time an operator complains of short run time and whenever cells or cables are replaced. These records will be invaluable when it comes to predicting when battery replacement will be necessary. 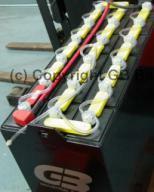 Charger Model# Breakdown: Example, Model GB100-3-18-750 = GB brand, 100% rated, 3 phase, 18 cell (36 volt), 750AH (Ampere Hour). Battery Model# Breakdown: Example, Model 18-125-13 = 18 cells (x2 = 36 volt), 125AH per plate, 13 negative plates. Calculating AH Capacity: Negative plates per cell – 1, / 2 x AH per plate = AH (Ampere Hour). Example, battery model 18-125-13, 36V / 750AH: 750 x 36 = 27,000 / 1000 = 27 x .97 = 26.19KWH. Sample voltages are for a 12-volt / 6 cell battery system (figured at 10.5 volts = fully discharged, and 77 degrees F). For a 24-volt battery multiply by 2, for a 36-volt battery multiply by 3, 48-volt battery multiply by 4. VPC is the volts per individual cell - if you measure more than a .2 volt difference between each cell, you need to equalize, or the battery is beginning to go bad, or it could be sulfated. These voltages are for batteries that have been at rest for 3 hours or more. Batteries that are being charged will be higher - the voltages while charging will not tell you anything, you have to let the battery sit for approx. 3hrs. For longest life, batteries should stay in the green zone. Occasional dips into the yellow are not harmful, but continual discharges (or “cycles”) to those levels will shorten battery life considerably. It is important to realize that voltage measurements are only approximate. Note the large voltage drop in the last 10%. How does the Cold Cranking Amperage rating help me select a battery? What is the difference between deep cycle batteries and starting batteries? What is the difference between series and parallel battery connections and how do they increase battery capacity and voltage? Does over discharging damage batteries? How can I evaluate the health and state of charge (SOC) of a battery? CCA is the maximum amperes that can be continuously removed from a battery for 30 seconds at 0°F before its voltage drops to unusable levels. A 550 CCA battery can supply 550 amperes for 30 seconds at 0°F. This rating is only useful in the selection of engine starting batteries. For instance, GB uses thicker lead grids (the plate's skeletal structure) to support additional positive plate oxides which are compressed into a denser form in order to add battery reactive material for greater Reserve Capacity and Cycling Performance. In addition, these plates are separated by indestructible separators. These mats hold the active oxides tightly in place during the cubical plate expansion, which occurs during deep discharging, instead of allowing the oxides to shed off and precipitate to the bottom of the battery. Construction materials such as those raise the Reserve Capacity of a battery and increase the battery's Cycle Life. One cycle of a battery is a discharge from full charge to full discharge and a return to full charge again. The total number of cycles a battery can perform before failure is called its Cycle Life. Most battery manufacturers will not discus the Cycle Life of their product. Many advertised Deep Cycle batteries have not been tested, or, which is the case with cranking batteries, were never designed for long Cycle Life. Unfortunately, the term Deep Cycle has been overused by the battery industry as a sales tool to imply a heavy-duty product. This has led to confusion and difficulty in battery selection. One must understand that any battery may be termed deep cycle as all batteries may be fully discharged and charged. However, a true deep cycle battery, such as Rolls or Lifeline, is capable of thousands of these hard cycles during its life without losing its capacity. Comparatively, many advertised deep cycle batteries composed of thin plates, excessively porous separators, and low density plate oxides will suffer permanent capacity loss after a few dozen cycles and will shortly sulfate or shed plate material and fail. Batteries without substantial materials designed for true deep cycling will lose more than half of their capacity after only a few cycles. A 200 Amp-hour battery will shortly become a 100 Amp-hour battery for the remainder of its shortened service life. What initially may seem to be an inexpensive battery to purchase, now costs twice as much per Amp-hour. True Deep cycle batteries will perform well as cranking batteries, however, cranking batteries will not survive deep cycle use. OVERCHARGING is the most destructive element in battery service. Usually the boater is not aware that this is occurring as he believes his alternator or battery charger is "automatic." Unfortunately, these automatic circuits are sensitive to voltage surges, heat, direct lightening strikes and indirect lightening electromagnetic influences and could fail or shift their calibration. When they fail, overcharging begins to affect the batteries. During overcharging, excessive current causes the oxides on the plates of the battery to "shed" and precipitate to the bottom of the cell and also heat the battery, thus removing water from the electrolyte. Once removed, this material (which represents capacity) is no longer active in the battery. In addition, the loss of water from the electrolyte may expose portions of the plates and cause the exposed areas to oxidize and become inactive, thus reducing additional capacity. Sealed batteries are not immune from the same internal results when overcharged. In fact, sealed recombination absorption and gel batteries are particularly sensitive to overcharging. Once moisture is removed from the battery, it cannot be replaced. Portions of the battery damaged due to overcharging are irretrievable. However, if detected early, corrective adjustments to the charging device will save the undamaged portion of the battery. Initial signs of overcharging are excessive usage of water in the battery, continuously warm batteries, or higher than normal battery voltages while under the influence of the charger. If overcharging is suspected, correct immediately. OVERDISCHARGING is a problem which originates from insufficient battery capacity causing the batteries to be overworked. Discharges deeper than 50% (in reality well below 12.0 Volts or 1.200 Specific Gravity) significantly shorten the Cycle Life of a battery without increasing the usable depth of cycle. Infrequent or inadequate complete recharging can also cause over discharging symptoms called SULFATION. Despite that charging equipment is regulating back properly, over discharging symptoms are displayed as loss of battery capacity and lower than normal specific gravity. Sulfation occurs when sulfur from the electrolyte combines with the lead on the plates and forms lead-sulfate. Once this condition becomes chronic, marine battery chargers will not remove the hardened sulfate. Sulfation can usually be removed by a proper desulfation or equalization charge with external manual battery chargers. To accomplish this task, the flooded plate batteries must be charged at 6 to 10 amps. @ 2.4 to 2.5 volts per cell until all cells are gassing freely and their specific gravity returns to their full charge concentration. Sealed AGM batteries should be brought to 2.35 volts per cell and then discharged to 1.75 volts per cell and there this process must be repeated until the capacity returns to the battery. Gel batteries may not recover. In most cases, the battery may be returned to complete its service life. Routine battery examinations divulge irregularities in the charging system as well as in the batteries. The principle method is to examine the electrochemistry of the battery through hydrometric electrolyte inspection. As previously discussed, this important examination cannot be accomplished with AGM or GEL batteries. Voltage readings alone require experience to interpret. Hydrometric readings will uncover early warnings of overcharging or over discharging before batteries are damaged. The state-of-charge and reliability of a lead acid battery can best be determined by the specific gravity of the electrolyte measured directly with a common bulb-type hydrometer with a glass float. We do not recommend the ball float type hydrometer. Specific gravity is a unit of measurement for determining the sulfuric acid content of the electrolyte. The recommended fully charged specific gravity of marine batteries is 1.255 to 1.265 taken at 80°F. More than .025 spread in readings between fully charged cells indicates that the battery may need an equalization charge. If this condition persists, the cell is failing and the battery should be replaced. Since water has a value of 1.000, electrolyte with a specific gravity of 1.260 means it is 1.260 times heavier than pure water while pure concentrated sulfuric acid has a specific gravity of 1.835. 100% Charged  =  1.285 - 1.290 Sp. Gr. 75% Charged  =  1.240 - 1.245 Sp. Gr. 50% Charged  =  1.195 - 1.200 Sp. Gr. 25% Charged  =  1.150 - 1.155 Sp. Gr. 0% Charged  =  1.115 - 1.120 Sp. Gr. Do not apply hydrometer color-coding to readings taken from deep cycle batteries. These red-white-green markings are for "hot" automotive battery types. Also, hydrometer readings taken immediately after water is added to a cell is inaccurate. The water must be thoroughly mixed with the underlying electrolyte by charging, before hydrometer readings are reliable. In addition, do not assume a deep cycle battery will not take a charge because you have been charging it for a while and the float will not rise. If the battery has been fully discharged or partially sulfated it will require considerable charging or equalization before recovering. As electrolyte levels are reduced in the battery, it is important to add water to each cell. Note that only the water portion of the electrolyte evaporates, therefore, it is not necessary to add acid to a battery during maintenance. In fact, the addition of acid to an active battery will reduce its capacity and shorten its remaining life. Water should be added to cells after charging the battery. This will eliminate spillage due to expansion of electrolyte upon charging. Generally speaking, any water that is safe to drink is safe to use in a battery. Do not use water of a known high mineral content or stored in metallic containers. It is the metal impurities in the water that lower the performance of the battery. Distilled water guarantees purity. If you suspect your charger fails to shut off or your battery overheats for any reason, discontinue use immediately and call for service. Never hesitate to contact the service dept. in your state if you have any questions or concerns. NOTICE: Pursuant to the Digital Millennium Copyright Act, use of this unique copyright protected intellectual property (US Copyright #1-3049808771, GB Battery), or any derivation, variation, colorable imitation or any combination of the same in any way, for purposes including but not limited to the advertising, promotion and sale of products and services for private financial gain, commercial advantage, or enhancement of a competing website, brochure or marketing media, is an act of willful copyright infringement. Such willful infringement provides for substantial financial penalties and potential criminal prosecution. Remedies for such violations include not only injunctive relief against the infringer, but also recovery of profits and damages suffered by the copyright owner. 17 U.S.C.A. § 504. In addition, such relief includes recovery of attorneys' fees and costs incurred in connection with litigating the matter where infringement is willful.